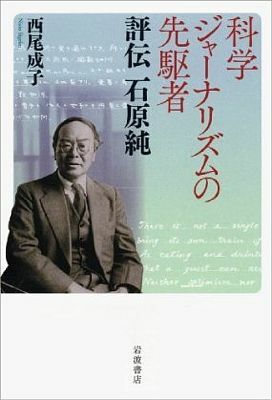 The cover of the book "Pioneer of Science Journalism: Biography of Jun Ishiwara." The name "Jun Ishiwara" seems to be unfamiliar to many people. So, the title of the book "Pioneer of Science Journalism" might be somewhat misleading. I am quite familiar with that name, thus probably being one of the few such people now. "Nihon Shokokumin Bunko)" (a series of books for children) was published in 1936, and its revised edition was issued after World War II. Then I was in the sixth grade of the elementary school or the first grade of the junior high school and liked to read that series. The author of its seventh volume "Mysteries of the World" (1948, Shincho) was Jun Ishiwara. I learned atoms and molecules from that book. In addition to the effect of this book, Hideki Yukawa's winning of the Nobel Prize (1949) made me walk on the way to physics. As noted at the beginning by the author, he was one of the best theoretical physicists. In the early twentieth century, he first published first papers in Japan on relativity and quantum theory, which brought about a revolution in physics, and led discussion in the country. This is the work in which Ishiwara (1881–1947) generalized the quantum rule independently of W. Wilson and A. Sommerfeld. The same paper has also been mentioned in Ref. 5. Reference 3 also includes Ishiwara's two articles written in Japanese [6, 7]. It is even a surprise that the name of such a scientist is little known. The love affair of Ishiwara, who had a wife and children, became a scandal, and he retired from the professorship at Tohoku Imperial University at the age of 42. Is this related to the unfamiliarity of him to people? After retirement, he pulled himself from research and became a person to discuss and communicate about science. Ishiwara's love affair, together with his activities as a poet, is described in some detail in "Wikipedia" . The review concludes by the sentence, "His life and words give us great suggestions about how the present-day science and scientists should be." I certainly want to read the book reviewed. S. Nishio, "Pioneer of Science Journalism: Biography of Jun Ishiwara," (Iwanami, 2011) In Japanese. A. Tsuji, "True scientist who discussed how physics should be," Asahi Shimbun (November 13, 2011) In Japanese. Physical Society of Japan, ed., "History of Physics in Japan, Vol. 2, Reerence Materials" (Tokai University Press, 1978) In Japanese. J. Ishiwara, "Die universelle Bedeutung dse Wirkungsquantums," Tokyo Sugaku Buturigakkai Kizi, Ser. 2, Vol. 8, pp. 106–116 (1915). J. Ishiwara, "Impression of Einstain," in Einstein and Relativity, J. Ishiwara (Kaizo, 1921) pp. 137–160. In Japanese. J. Ishiwara, "Earthquakes and science education," in Modern Natural Science, J. Ishiwara (1924) pp. 133–152. In Japanese. "Jun Ishiwara," Wikipedia, Japanese edition (November 16, 2011).